On December 14, the city council in Portland, Oregon, voted unanimously to set “the first stone in a green wall across the West Coast,” in the words of Mayor Charlie Hales. He was referring to a groundbreaking new zoning ordinance that effectively bans all new fossil-fuel-export infrastructure within the city’s limits—including new port facilities for shipping coal, and holding tanks for oil and natural gas—and prevents existing facilities from expanding. The vote marks a hard-fought victory for local activists and environmental groups. And, in anticipation of the Trump administration’s pro–fossil fuel agenda, it signals to other cities that innovative action to counter climate change is still possible at a local level. Hales wasn’t always so supportive of building a “green wall” against fossil-fuel exports. In fact, the two-year-long grassroots campaign that led to the new zoning ordinance began in opposition to Hales’s initial support for a $500 million propane export facility proposed by the Pembina Pipeline Corporation, the largest pipeline company in the Canadian tar sands. Local opponents—who organized themselves into a group calling itself the Climate Action Coalition—bird-dogged Hales at local events, photo-bombing him with their protest signs. They posted a caricature of Mayor Hales with the name “Fossil Fuel Charlie for Mayor” on Portland State University’s campus. On Earth Day 2015, coalition members briefly took over City Council proceedings, bearing giant cardboard cutouts of councilors’ faces and talk bubbles showing quotes in which they’d pledged to act swiftly on the climate crisis. Facing the choice between the propane-export terminal—the single largest business proposal in Portland history—and a well-organized pack of activist opponents, who submitted thousands of letters, e-mails and calls to City Hall, as well as Portland-area scientists who produced voluminous reports highlighting the potential catastrophe posed by mile-long trains filled with propane traversing the city’s rails each day, Hales finally surrendered: He took the Pembina propane-terminal proposal off the city’s docket. 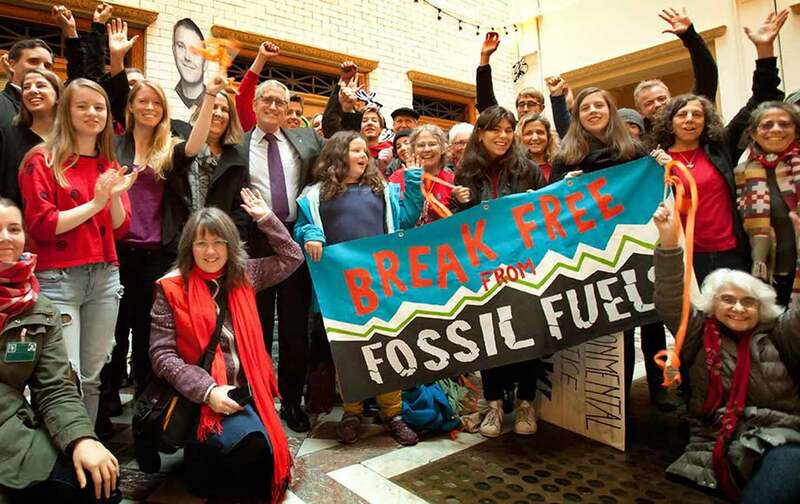 Portland’s move represents a groundbreaking offensive strategy to block future fossil fuel export infrastructure. Then Hales proposed a further step, supporting the call from the Climate Action Coalition for no new fossil-fuel-export infrastructure anywhere in the city’s limits. In October of 2015, Hales gave up a reelection bid and devoted the remainder of his time in office to passing his priority campaigns. That November, the first resolution opposing all new fossil-fuel infrastructure passed the City Council. Fast forward to December 2016: Two weeks before the end of his term, Hales succeeded in passing the strongest land-use ordinance opposing new fossil-fuel-export infrastructure in the country. Portland currently hosts 11 shipping terminals, serving 90 percent of the statewide market for fossil fuels. Oil spills regularly into the Portland Harbor on the Willamette River where the terminals and enormous holding tanks of petroleum and natural gas are located. That 10-mile stretch is a Superfund Site, slated by the EPA for a lengthy and costly cleanup. In addition, the Pacific Northwest is overdue for a major earthquake, but the fuel-holding tanks are not built to withstand one. If they’re still in place when the big one hits, this industrial zone in the city’s northwest will be among the first to liquefy, with potentially catastrophic consequences. The new ordinance directs various city departments to develop earthquake preparedness plans for the existing terminals, while also barring them from expanding. This port city, like many others on the West Coast, has lately been under siege with proposals for more oil-, gas-, coal-, propane-, and methanol-export facilities. Producers of crude oil extracted from the plains of North Dakota, coal from Wyoming’s Powder River Basin, natural gas fracked from Colorado’s shale beds, and oil from Canadian tar sands are all eyeing hungry markets in Asia. But to get their products across the Pacific, energy companies need new port and rail facilities, and new pipelines, to connect to refineries and tankers. Seattle-based Sightline Institute has calculated that all of the fossil-fuel-transport projects proposed in the Pacific Northwest (as of 2014) would process the carbon equivalent of five Keystone XL Pipelines annually. The projects also pose more immediate hazards, as illustrated by an explosive oil-train wreck in the Columbia River Gorge in June. Federal law prohibits municipalities from blocking or otherwise interfering with rail transit and interstate pipelines. Still, cities have wide latitude to govern their own health and safety, and by blocking export infrastructure, Portland will make it a bit harder for fossil fuels to get to the international market. Portland’s claim is that its green economy is both safer and healthier than one based on fossil fuels—and it is growing. According to a forthcoming study produced by the C40 Climate Leadership Group—a network of the world’s leading cities that are taking action on climate change—Portland’s low carbon goods and services sector “is a $10 billion industry with an average of 5% growth since 2012.” That sector includes, for example, a company that make energy efficient window inserts, and another that harnesses electricity from micro-turbines placed in the public water system. Pam Neal, the clean energy liaison for the Portland Development Commission, testified before Portland’s city council earlier this year that the sector has provided employment for 47,000 people living in the Portland metropolitan area, and is composed of 2,450 companies. For over five years, she added, Portland has been in the enviable position of being a net exporter of low carbon economic goods and services. By comparison, the 11 fossil fuel export and storage terminals (comprising some 300-plus individual tanks) now provide Portland with only 280 on-site jobs, supporting an estimated 720 total jobs in the metropolitan area. Portland is showing where its future lies: Not in the all-too-literal “boom and bust” fossil fuel economy, but in a more equitable low- to zero-carbon economy. No matter how many climate deniers occupy positions of power in Washington, DC, cities can and will lead the way on climate. 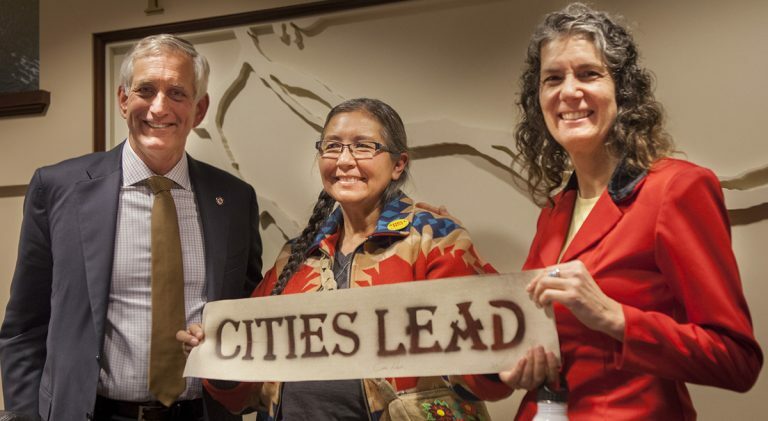 Indeed, already, over 30 elected officials, from California, Oregon, Washington, and British Columbia have signed on in support of Portland’s groundbreaking move and pledge to put in place similar restrictions on fossil fuel export infrastructure in their jurisdictions. Earlier this year Oakland, California banned future coal infrastructure, and Vancouver, Washington barred new oil terminals. Should conservative politicians challenge this approach, they will find massive resistance from grassroots groups and local elected officials alike. And they will be contradicting a fundamental credo of their own conservatism: That the government closest to the people is best able to decide what is best for the people.